Jeremy had a low grade fever at 1am last night. It came down with Panadol, and stayed down until bedtime tonight, when he was given more Panadol. The fever was probably caused by his immunisations on Saturday. He had a quiet day at home, doing some school work and playing on the computer. He still has a bit of cough remaining from last time he was sick, and it seems to have become worse over the last 2 days. Jeremy had his second set of childhood immunisations today (the ones that he was supposed to have on 12 May). Hopefully, he will be OK over the next few days. Today was the end of week 6 - Jeremy is now more than half way through Term 2 of Kindy! At the moment, Jeremy's favourite food is homemade sushi with just plain white rice inside. He wants it for breakfast, school lunch, afternoon tea and dinner! Tonight, BaBa and Mummy went to our first Cure Our Kids Parents Gathering dinner at North Ryde. Cure Our Kids is a charity that specifically looks after children with cancer and their families at Westmead Hospital, and it was great to meet other parents who had been through the cancer journey with their children and to share stories. We were very encouraged to learn that some children have been in remission for 5 years or more - we sat next to a couple whose son had beaten 3 different types of cancers, who had a bone marrow transplant in 2001, and who has been in remission since . It was also good to catch up with other parents who had been in hospital with us last year, and to hear how their children are going with their treatment. As to what Jeremy thought about Mummy not being there to tuck him in - well, that's between him and GooPaw! Back to school, after being away sick for a week and a half. We pray that Jeremy doesn't catch any more infections, especially as the winter months are nearly here! As part of a special Sunday School this morning, Stephanie and Jeremy watched a fun puppet show presented by Quiz Worx! 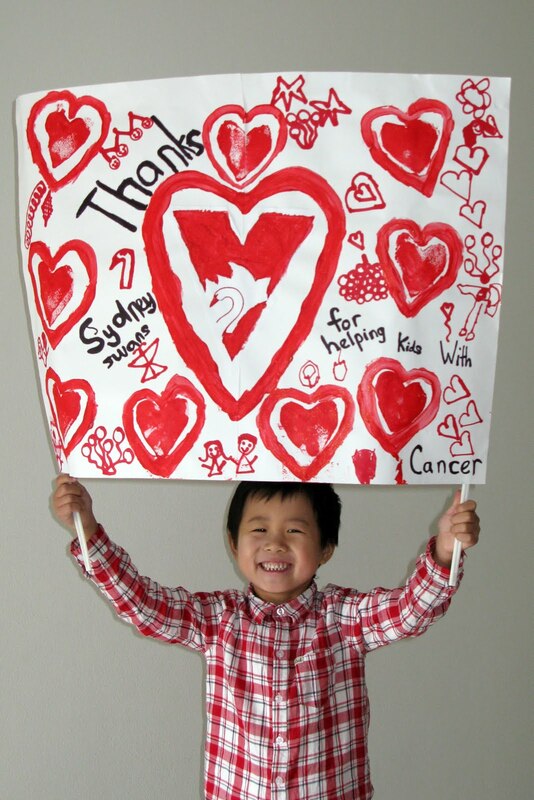 Today we enjoyed going to the Sydney Swans Family Day, which was hosted by the children's cancer charity Redkite. We had lunch at the Sydney Football Stadium, where Stephanie and Jeremy decorated kite-shaped pieces of cardboard and also had their faces painted (red and white, of course!). We were very surprised and pleased when they won 2nd prize in the banner competition - it was their first time making a banner, and we hadn't known what to expect! After lunch, we walked across to the Sydney Cricket Ground to watch the pre-match "Redkite and OCF Celebrity AFL Game". Then it was time for the match between the Sydney Swans and the Fremantle Dockers to begin. Jeremy was especially excited to be part of the guard of honour (with Stephanie and some other children of Redkite families) when the Sydney Swans ran onto the field. Last year, he wasn't allowed onto the field because he was too young. Unfortunately, our seats were at the opposite side of the field and we couldn't see any of the guard of honour because of the huge 4m high banner that the Sydney Swans run through. Although it was pouring with rain this morning, thankfully the weather had cleared up when we arrived at the SCG and it was warm and sunny for the guard of honour. The sky remained clear for the first part of the match. However, we decided to leave at half time because grey clouds were looming, and by the time we walked back to our car it had started raining again! Thankfully, no more earaches today! 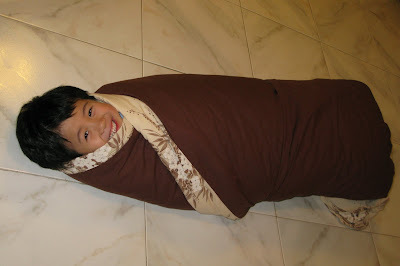 Just a happy little chef who wanted to be wrapped up like a baby! Jeremy had his first ever earache this afternoon. He was quite upset - but Panadol and a nap made it all better! The doctor told us today that Jeremy's NPA last Wednesday has come back positive for RSV (a virus that causes respiratory infections). Being a virus, there is not much one can do except rest and recover. Hopefully, Jeremy's immune system will become stronger as it fights off this viral infection. However, she wants Jeremy to continue with his antibiotics, as she is still waiting for some blood results which may show that he also had a bacterial infection - as antibiotics treat bacterial, not viral, infections. As nothing had grown from any of the blood cultures and tests, NPAs or throat swabs and as Jeremy remained fever-free, the doctor decided to discharge him from hospital today with a week's course of antibiotics (which should protect him IF anything were to grow and prove that he had a bacterial infection). Jeremy remained afebrile all day - so either the suspected virus had run its course, or alternatively the possible bacterial infection had responded to the antibiotics. 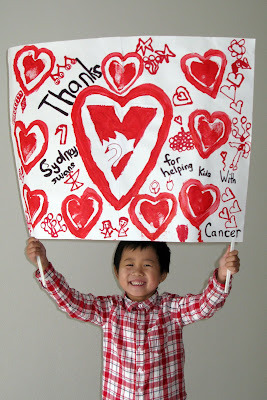 He and Stephanie had fun drawing on the whiteboard in his room and making up a menu for their cafe! There was a bit of drama in the afternoon, when Jeremy was mucking around and toppled out of his bed. He was only a little bruised, but had managed to rip out the canula in his hand when he fell - thus requiring the doctor to insert a replacement canula into his right hand. She also decided to do a throat swab on him, as he was still coughing badly. Jeremy went to hospital clinic today, but did not have his immunisations or Fluvax because of his snuffy nose and cough. Instead he was subjected to an NPA (Nasopharyngeal Aspiration) - or in other words, a thin tube shoved up his nose and some snot vacuumed out of each nostril. The snot is then sent for cultures to see if they can identify a virus and then prescribe some medicine to treat it. Needless to say, NPAs are not Jeremy's favourite procedure! Jeremy fell asleep on the way home from clinic, and when we got home he was shaking and feverish (39.7 degrees!). He was given Panadol and went to sleep. About half an hour later, he woke up wanting to eat popcorn and iceblocks and play computer - both good signs - but he was still febrile. The doctor told us that we should give him Panadol on a regular basis, and that he would call us if anything is grown from the NPA. Thankfully, as he no longer has a central line, there is no need to admit him as soon as he has a fever - he can just recover from a virus at home like the rest of us! In addition to his snuffy nose, Jeremy has now developed a barking cough - but thankfully no fever or sore throat. T+236 - Happy Mothers Day! We are so thankful that we can celebrate Mothers Day together as a family of four! Jeremy was delighted today to be able to go "shopping" and buy a Mothers Day present at the K-2 Mothers Day stall. It was his first Mothers Day stall (and Stephanie's last!). Each child from K-2 was asked to bring in an unwrapped present worth $6, and then today each child brought in $3 to buy one of the presents from their class collection. So effectively we spent $18 on two mystery presents to be unveiled on Sunday! The money raised will be used for the K-2 end-of-year picnic bus fares and iceblocks. Both children came home very pleased with their purchases, which were wrapped in their own beautiful handmade wrapping paper. Jeremy is still excited about his assembly item yesterday, and keeps showing us the dances of the other colour groups! Jeremy was very excited today for many reasons, one of which was that his kindy class performed at the weekly K-2 Assembly today. Each of the K-2 classes takes it in turns to run the weekly Wednesday assembly, which includes chairing the whole assembly as well as presenting an item. Jeremy's class was the first kindy class to run an assembly this year, and they talked about colours. The class was divided up into red, blue, green, orange and yellow - Jeremy was in the yellow group. Jeremy was supposed to say "yellow is bright and happy", but there was a bit of a mixup with the order in his yellow group and he said a few extra words too! Then he and another "yellow" girl did a dance - it was so cute! After all the colours had done their dances, their item finished with the whole class performing a dance together. 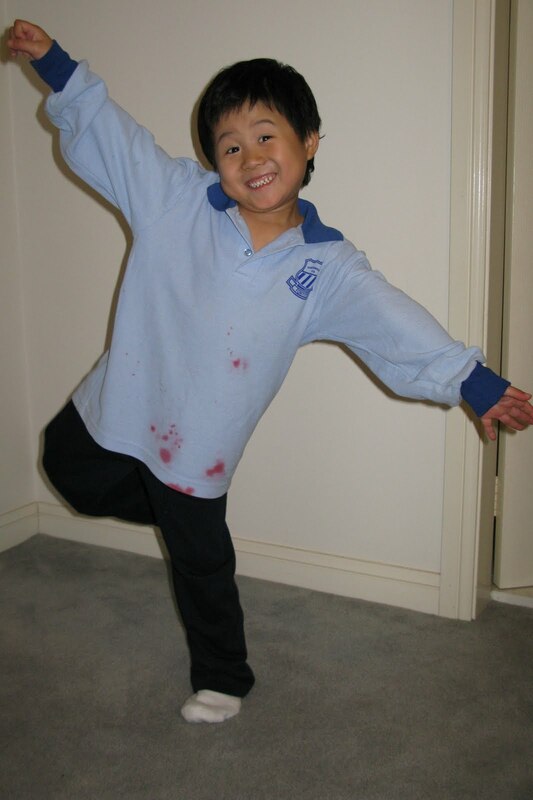 No, it's not blood - just someone forgot to wear their painting smock at school today! We are thankful for a happy day spent with family enjoying "crunchy" (pork) for lunch and making both savoury and sweet jin deui!